With America’s eyes turning toward the battle for Rifqa Bary in Florida, it seemed fitting to pull this one out of the vault. Americans are famously clueless about history, but especially so when it comes to the history of Islam and Christianity. When I was in Bar Exam preparation, the lecturer, who was your typical American WASP, aparently felt the need to vent concerning the Crusades. He said the kings and knights went off to “teach Christianity to the heathens” in the Middle East, and how they completely destroyed the “Islamic Culture” there “that had existed for thousands of years.” He then went back to legal matters, but many listening had no doubt been entrenched more deeply in very popular and very dangerous misconceptions. Circumstances prevented me from addressing him directly, but I would have liked to point out that, at the time of the Crusades, “Islamic culture” had existed for about 400 years (Christianity, for the record, had been around for about 1000), that the Crusades had nothing to do with converting anyone or teaching anyone anything, but were about reclaiming territory and securing safe pilgrimages for the already faithful, and that they had hardly been unprovoked. And so it goes. Throughout history, from the class room to the silver screen, Christianity is portrayed as having spread out violently from Europe, destroying the peaceful, environmentally sound cultures in its path. Will the real story ever be told? Balian (Bloom) at the Battle of Kerak, courtessy of Wikipedia. 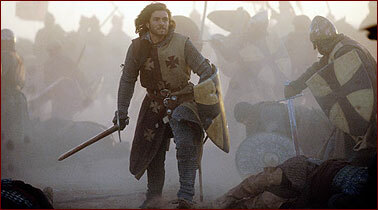 Kingdom of Heaven is a definite improvement. Most of the characters we get to know are on the Christian side. Most of them are admirable. The biggest surprise was that the movie portrayed Muslims, Christians and Jews as living peacefully side by side for much of the story. One knight tells the lead, Balian of Ibelin (Orlando Bloom) that his father, Grodfrey of Ibelin (Liam Neeson) kept Jerusalem as a place of prayer for all faiths, just as the Muslims did before them. (At least now both sides are equally misrepresented.) The villains of the story are Guy de Lusigan (Marton Csokas) and Reynald (Brendan Gleeson), two French knights who want to provoke a war with Syria. 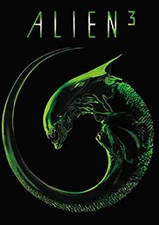 (Those who care to check out the DVD extras will notice the real Guy, at least, wasn’t so bad) They succeed about two thirds of the way through, which leads up to the climactic battle (which, I might add, is a great piece of film-making). We don’t see enough scenes on the Muslim side to really like or dislike them. We do see a brief shot of Saladin crying over the bodies of men slain in battle. We see a lot of shots of both sides shouting “God wills it!” as they move into battle. In the book “Unveiling Islam,” Ergun Caner, a former Muslim, comments that this cry (Dues Volt! in Latin) was only adopted in Europe after centuries of raids and colonization by the Arabs. Other features of Islam seem to have rubbed off on Christians about this time. For instance, the teaching in Islam that one who dies in jihad automatically goes to paradise (Hadith 4:73, 9:93:555) seems to have been adopted by Pope Leo IV, when he promised forgiveness of sins to any who fought the Muslims. 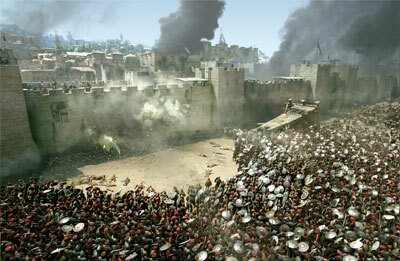 Saladin attacks Jerusalem in a great battle scene. There are a number of battles in history that I have often wished someone would make a movie out of – battles that represent some of Christian Europe’s victories over the Jihad. For instance, the Battle of Tours (A.D. 732), where the French stopped a Muslim army that had pillaged its way across northern Africa and Spain, thus saving western civilization. Or the naval Battle of Lepanto (1571) that broke the Turks’ stranglehold on the Mediterranean and liberated thousands of slaves. Or the valiant defense of Constantinople, which resisted the Ottoman empire (which terrorized the world for about 500 years) for centuries. And then, of course, there were a series of battles late in WWI that marked the final destruction of the Ottomans and the liberation of the Serbs (who are now vilified as oppressors of Muslims). Today, we’re watching the story of a young potential martyr unfold from our livingrooms. On one hand it seems like a pipe dream to hope that these stories will ever get the remembrance and celebration they deserve in the present climate. 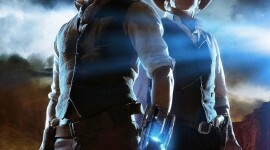 Americans can’t seem to fathom a time when western culture was in danger of being overrun. Still, Kingdom of Heaven might be a step in the right direction. Maybe the next Ridley Scott will read this column. Time will tell.